Last night I got out of work with plans to go home and blog about my trip. Little did I know that the Gods were against me. I had a flat, so I called my bro 'cause I didn't want to hurt my back. Since I had to buy a new tire, I decided to go buy it right then. When I got to Pricesmart I had the tire guy check another tire that looked weird. 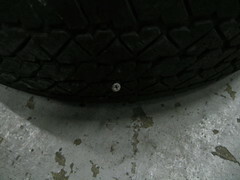 A nail had gone thru it, so I guess I did not only have 1, but 2 flats yesterday. Its a curse!!!! The 2 flats curse, We have to warn Libelula and Annush and Jose just in case.